Which two Earth systems best complete the sentence? 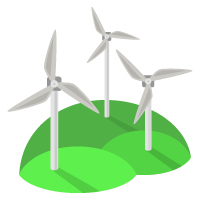 Wind turbines are machines that change wind energy in the into electrical energy for use in the . By what are most differences in air pressure caused by? What happens when wood is burned? It releases oxygen into the atmosphere. It releases nitrogen into the atmosphere. It releases carbon into the atmosphere. It releases hydrogen into the atmosphere. What is the thin layer of air that surrounds Earth? What is the thin envelope of gases that forms Earth's outermost layer? has no effect on heat gain or loss. allows heat to escape quickly in order to cool the planet. keeps heat from escaping too quickly into space. the layer in which weather occurs. the layer that contains the ozone layer. the layer of water in the oceans. the layer of gases that surrounds Earth. The moon does NOT affect Earth's . Which word better matches the sentence? It will most likely rain later tonight in Jacksonville, Florida. Breathing is a passive process that is run by differences in the and pressures. . This is the layer of gases that surrounds Earth. Mars's atmosphere is 90 times the density of Earth's atmosphere. A glacier is a large mass of ice that moves over land. It changes the shape of the land as it moves. One way a glacier changes the shape of the land is by the process of plucking. The weight of the glacier can break apart the rocks underneath it. The rocks freeze to the bottom of the glacier. The glacier then carries the rocks with it as it slowly moves. Plucking is an example of an interaction between which two major Earth systems?